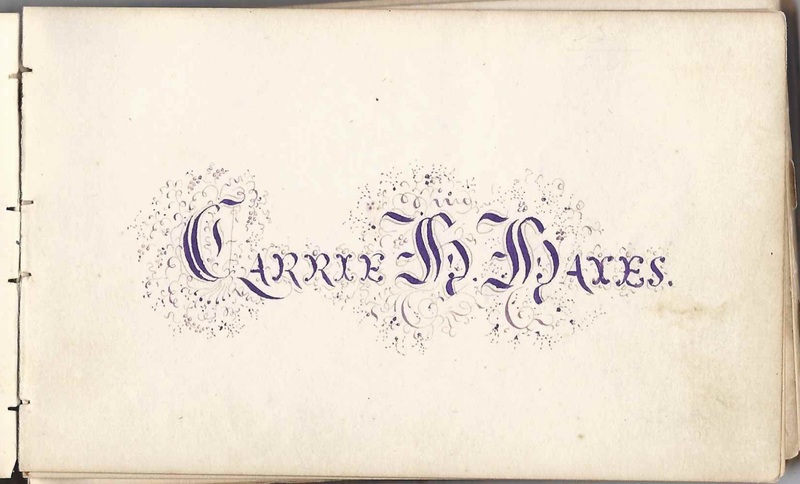 1860s/1870s autograph album of Carrie Hortense Hayes of Northfield, Vermont. Although this was not the first signed page in the album, it was fairly close to the front and may have been penned by the album owner. 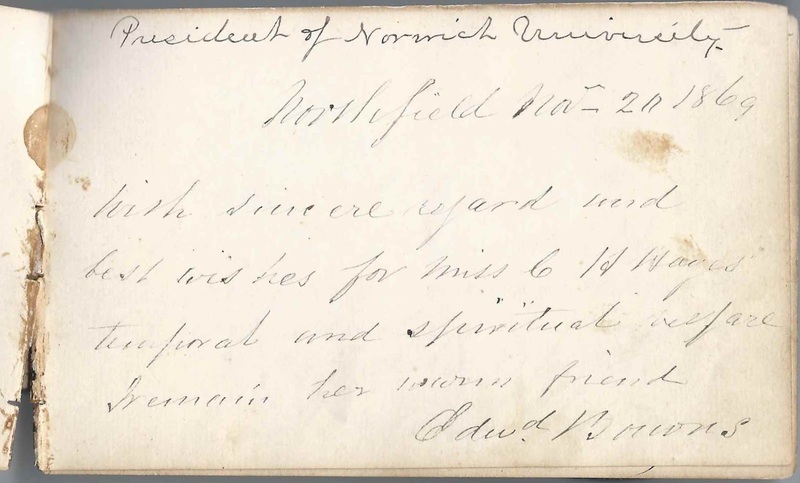 The album measures approximately 5-1/2" x 3-1/4" and contains the sentiments of nearly 70 of Carrie's relatives, teachers, friends and schoolmates, as well as two Norwich University presidents and many students from there. Carrie Hortense Hayes was born 15 May 1855 at Barton, Wisconsin, the daughter of Dr. Asa Hinckley Hayes and Josephine Maria (Foster) Hayes. I believe it was this Asa H. Hayes who was the surgeon with Company S of the 16th Wisconsin Infantry during the Civil War. 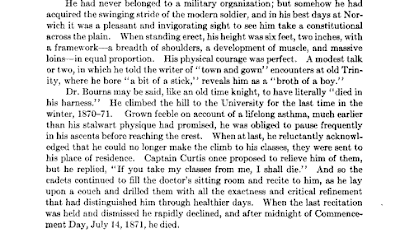 The June 8, 1865 issue of the Janesville Gazette mentions the recent death of Dr. Asa H. Hayes on "Thursday last." 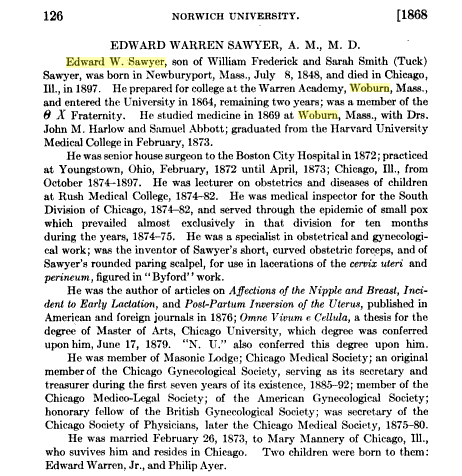 It also notes that Dr. Hayes was an old and respected citizen of Barton. 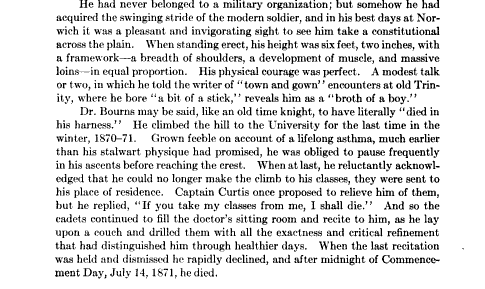 This is a bit concerning because Dr. Hayes would have been only in his 40s, but perhaps the Civil War aged him considerably. 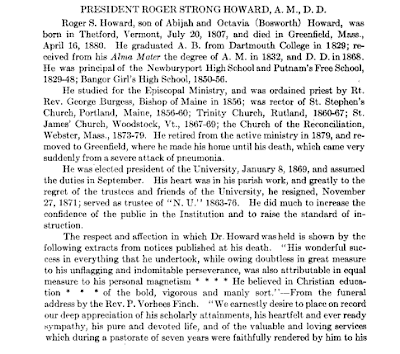 But I had suspected that Dr. Hayes had died because by the time of the 1870 Census, Carrie and her mother Josephine were back at Northfield, Vermont, in the household of Josephine's parents Leander and Abigail (Drew)Foster. 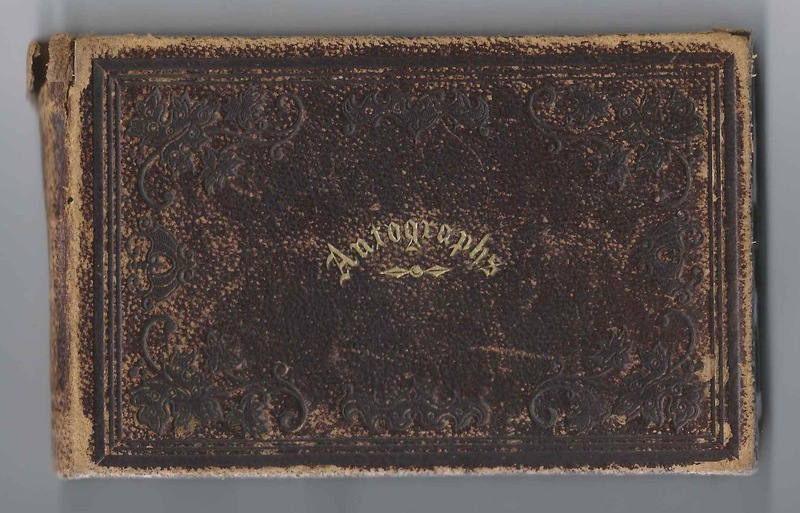 Leander and Abigail inscribed facing pages in Carrie's album. 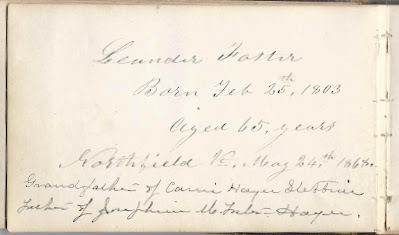 Leander included his birth date and age: "Born Feb 25th 1803 Aged 65 years". 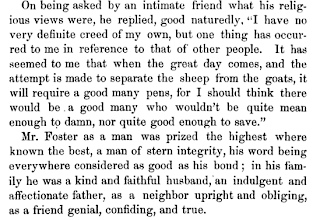 He wrote his page at Northfield, Vermont, on May 24, 1868. 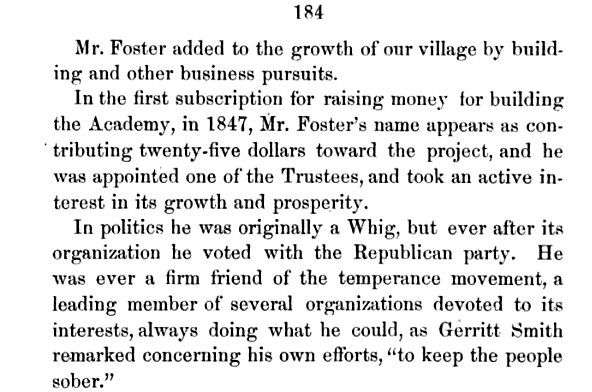 Leander was included in a book entitled "Centennial Proceedings and Historical Incidents of the Early Settlers of Northfield, Vt., with Biographical Sketches of Prominent Business Men Who Have Been and Are Now Residents of the Town", published two years after the town's centennial year, by Hon. John Gregory in 1878. On 19 May 1875 at Northfield, Vermont, Carrie Hortense Hayes married Edwin Strong Stebbins, son of Anson and Adeline Ezoa (Strong) Stebbins. 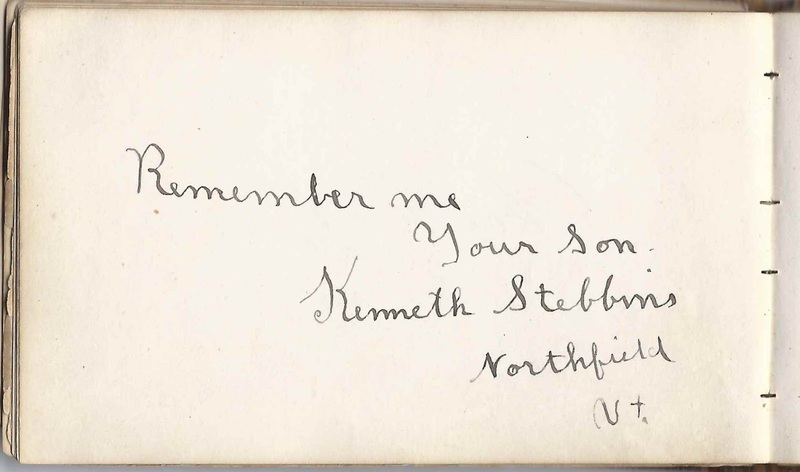 They had three sons, the youngest of whom, Kenneth Foster Stebbins, wrote in his mother's album when it apparently came to light long after most of the other signers had signed in it. 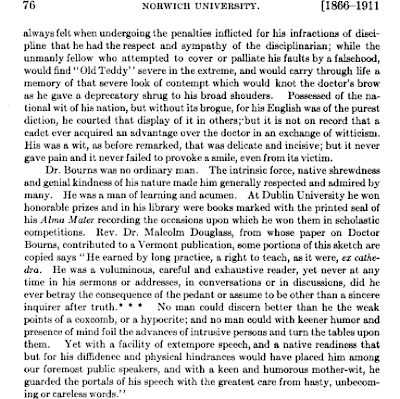 Kenneth attended Norwich University, as this brief bio recounts. 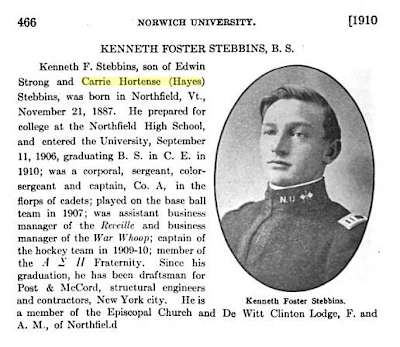 Edwin Strong Stebbins died in 1892. Carrie lived until 1943. If you have corrections and/or additions to the information above, or information on any of the signers listed below, please leave a comment or contact me directly. Thanks! 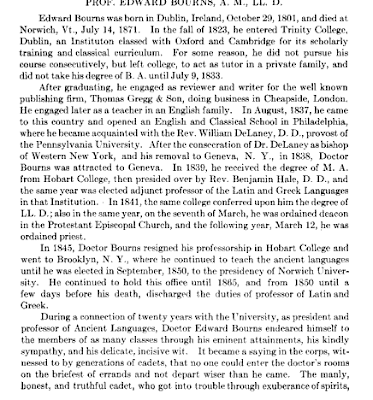 Most of the information on the signers with a connection to Norwich University comes from "Norwich University, 1819-1911: her History, her Graduates, her Roll of Honor", published in three volumes by Major-General Grenville M. Dodge and edited and compiled by William Arba Ellis, and alumni publications. Two of the signers were presidents of Norwich University. 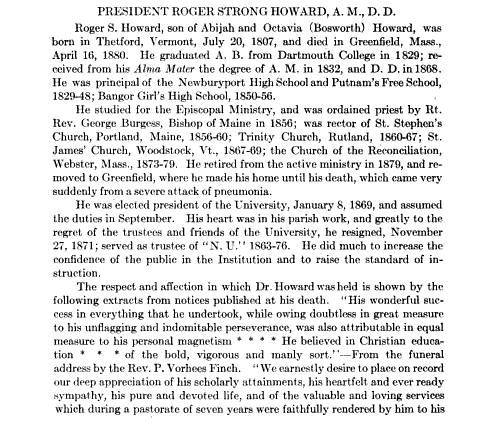 Roger Strong Howard signed a page on December 7, 1869. 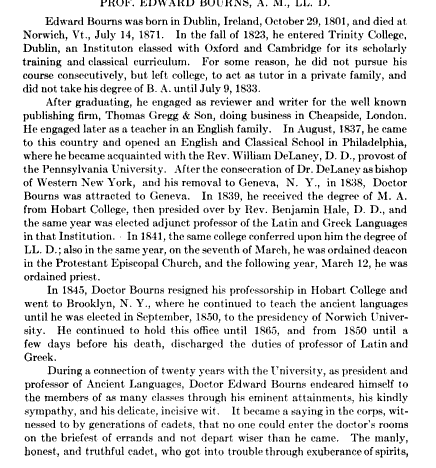 The other person with the notation that he was a president of Norwich University was Edward Bourns, who signed at Northfield, Vermont, in November 1869. 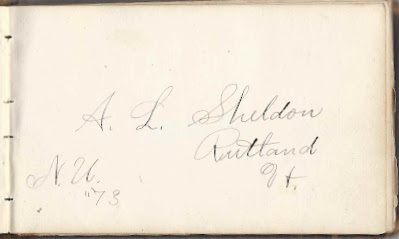 A. L. Sheldon of Rutland, Vermont, signed a page at Norwich University and indicated he was in the Class of 1873. He was Archie Lorenzo Sheldon. Ed. 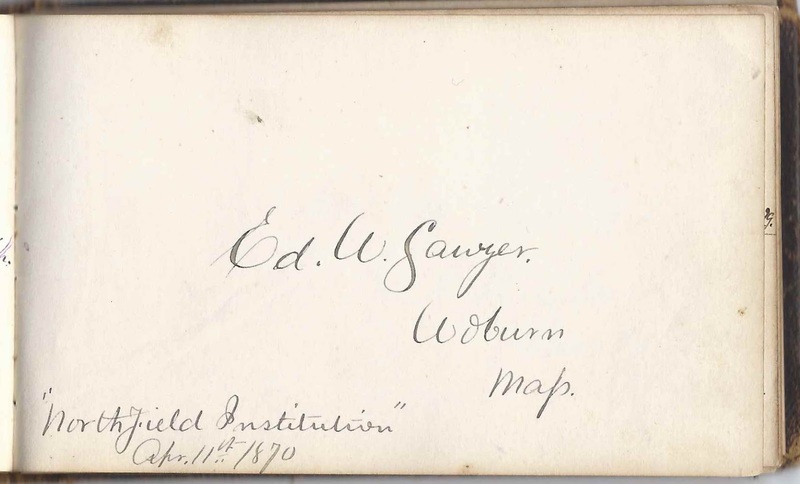 W. Sawyer of Woburn, Massachusetts, signed a page at "Northfield Institution" on April 11, 1870. 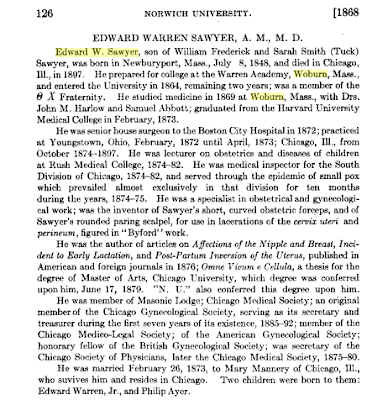 He was Edward Warren Sawyer. 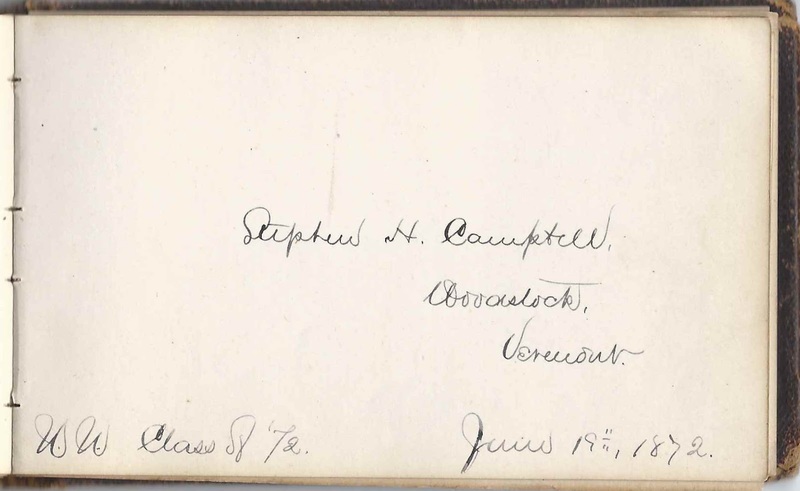 Stephen H. Campbell signed a page at Woodstock, Vermont on June 19, 1872. Sam. 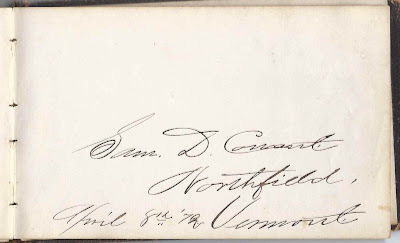 D. Conant of Northfield, Vermont, signed a page on April 8, 1872. 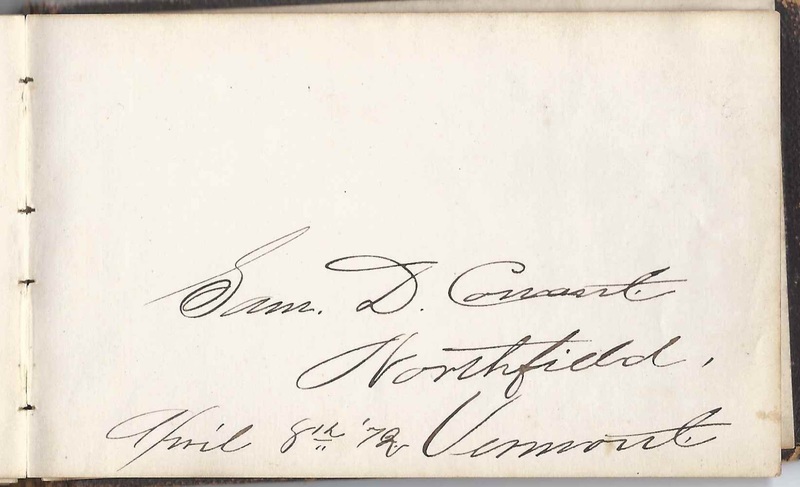 Charles G. Griffith of Brooklyn, New York, signed a page at Norwich University and indicated he was in the class of 1872. 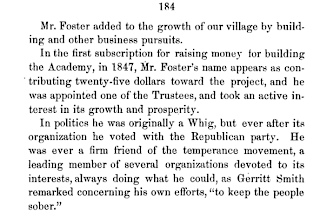 He was Charles Greenleaf Griffith. Another signer was Rev. J. 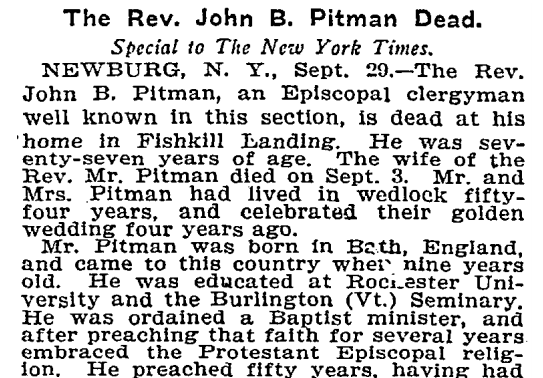 B. Pitman of Swanton, Vermont. He was Rev. John B. Pitman, born at Bath, England about 1825; he came to the United States at about age 9. After graduating from Rochester University and Burlington Seminary, he ministered to churches in Vermont, New York and Ohio. He married Mary A. Cady, daughter of Deacon Calvin and Betsey (Merrill) Cady of Northfield, Vermont. 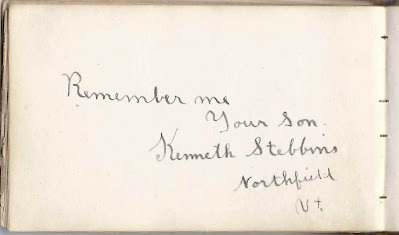 One of the signers, Sarah H. Kimball of Northfield, Vermont, was a sister to a Ladella Calista Kimball, whose autograph album was featured in an earlier post. She signed on March 23, 1871. 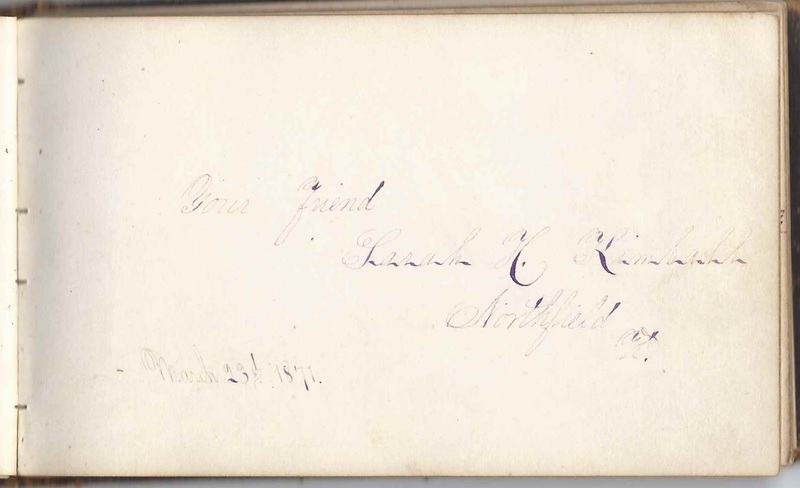 Sarah signed in her sister's album as Sarah H. H. in 1880, reflecting that fact that she had since married James Henry Hazelton. 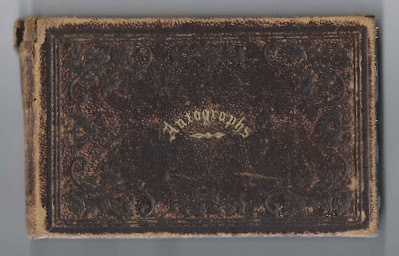 M. V. Ainsworth, signed at Northfield, Vermont, on November 7, 1872. Possibly Viola M. Ainsworth? 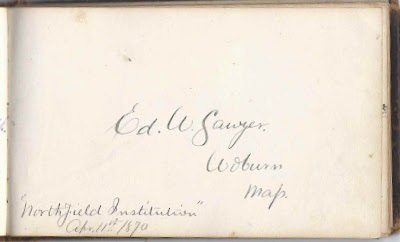 W. W. Allen of Ayer, Massachusetts; possibly the William W. Allen of Ayer Junction, Massachusetts, who signed another page. 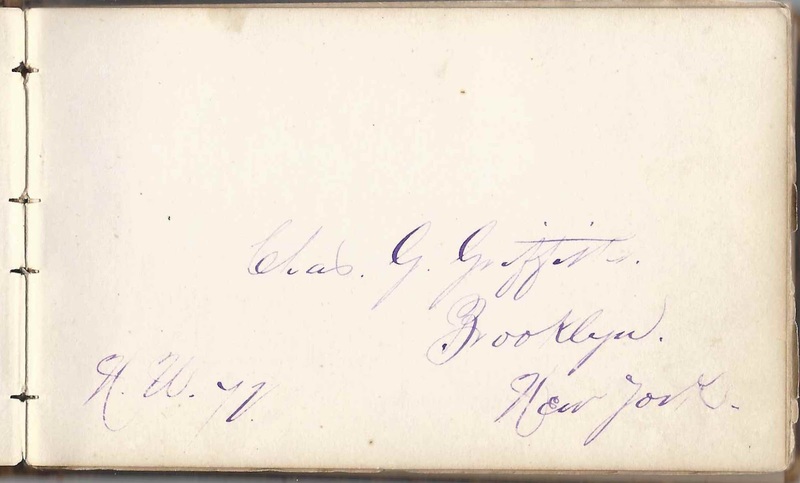 William W. Allen of Ayer Junction, Massachusetts; presumably the same W. W. Allen of Ayer, Massachusetts, who signed another page. Jeff. 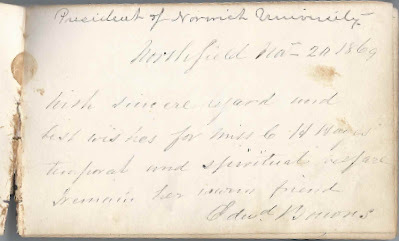 Averill of Northfield, Vermont, signed on January 21, 1872. 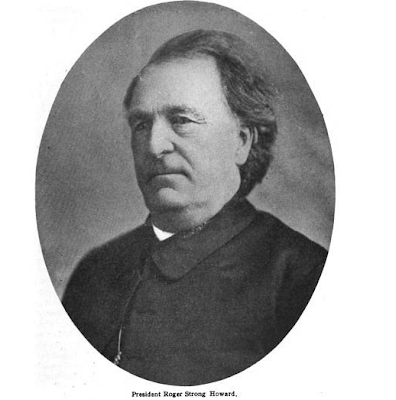 He was born 20 February 1847 at Northfield, Vermont, son of Thomas and Fanny (Howes) Averill. In 1874, Jefferson married signer Sarah Jane "Jennie" (Gilman) Phillips of Michigan. He had gone to Michigan about 1860 and was a teacher. He had three children with Jennie; he died in 1881 at the age of 40. Bertie M. Brooks of Northfield, Vermont, signed on April 6, 1871. Presumably Alberta M. Brooks, daughter of Josiah Prentice Brooks, Jr., and Fanny (Dunsmore) Brooks and future wife of Charles A. Reed. 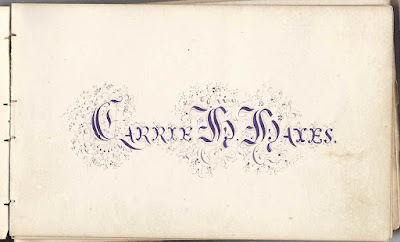 Alice M. Brown of Northfield, Vermont, signed on May 12, 1875 "Algebraically Yours"; Carrie's schoolmate in the winter of 1874. Possibly the Alice M. Brown who was the daughter of Hiram and Lucretia Brown. Henrietta Brown of Boston, Massachusetts, signed on August 31, 1871. Daughter of Henry H. and Julia Brown, and sister of signer Carrie A. Brown. Carrie A. 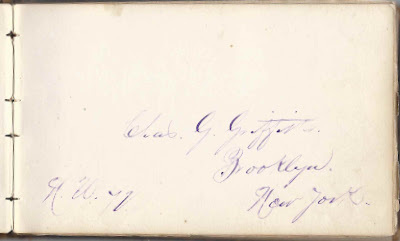 Brown of Boston, Massachusetts, signed August 31, 1871. Daughter of Henry H. and Julia Brown, and sister of signer Henrietta Brown. 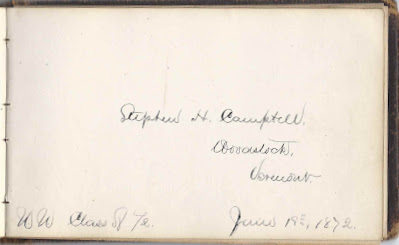 Stephen H. Campbell of Woodstock, Vermont, signed on June 19, 1872, N.U. Class of '72. 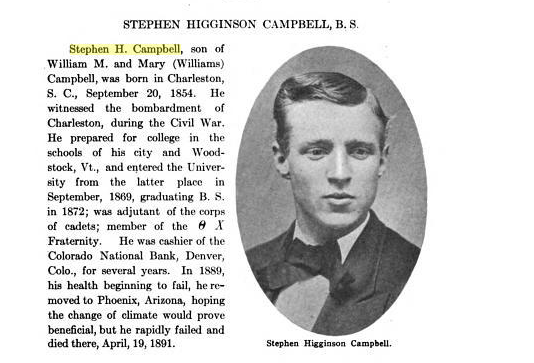 From Norwich University records: he was born at Charleston, South Carolina, on 20 September 1854, the son of William H. and Mary (Williams) Campbell. After graduation, he moved west and became cashier at the Colorado National Bank at Denver, before retiring early because of ill health and seeking out the climate of Arizona. He died 19 April 1891. Sam. 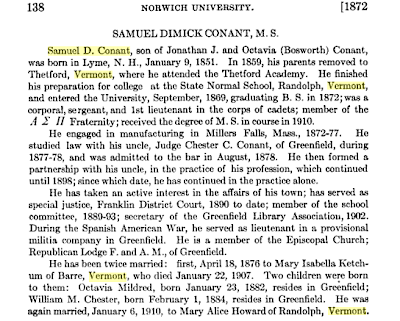 D. Conant of Northfield, Vermont, signed on April 8, 1872. 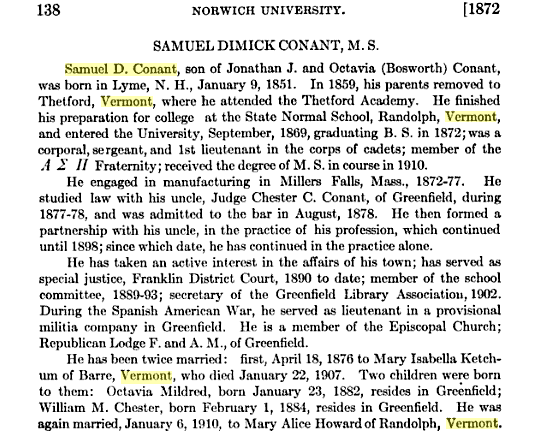 From Norwich University records: Samuel Dimick Conant, born 9 January 1851 at Lyme, New Hampshire, son of Jonathan J. and Octavia (Howard or Bosworth) Conant. He became a lawyer at Greenfield, Massachusetts. May Gilman Dole of Northfield, Vermont, signed on January 21, 1872. She was Mary Ione (Gilman) Dole, born 5 February 1850 at Paw Paw, Michigan, daughter of Joseph and Annis (Dole) Gilman of Paw Paw, Michigan. She married Charles H. Dole of Northfield, Vermont. 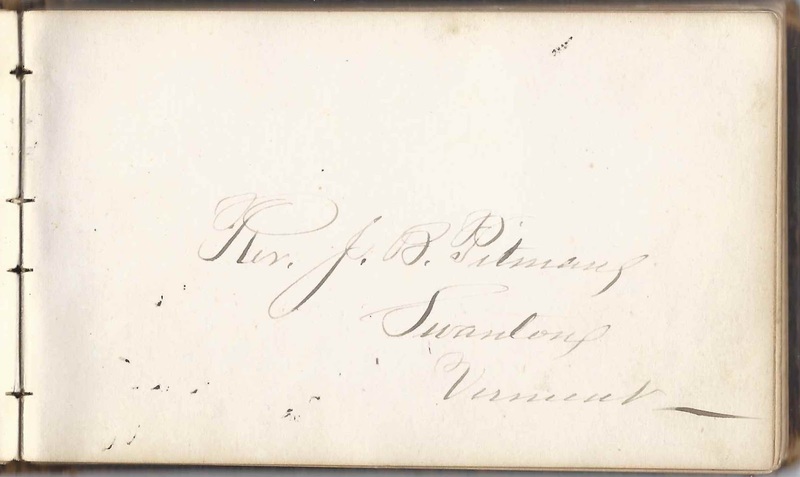 Her sister, Jennie (Gilman) Phillips also signed a page. Her mother Annis Dole was originally from Northfield, Vermont, and her husband Joseph was also a native Vermonter. 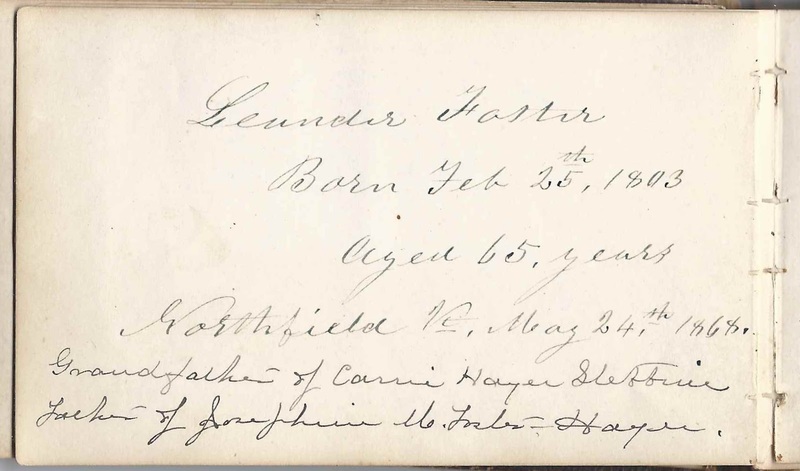 Jane E. Fisk of Northfield, Vermont, signed on March 29, 1870. Perhaps Jane E. (Nichols) Fisk, wife of George Fisk and daughter of James and Harriet (West) Nichols. 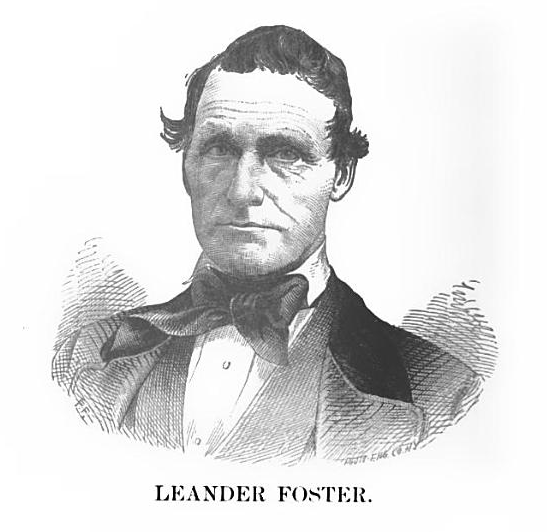 Leander Foster, born Feb. 25th, 1803, aged 65 years, signed at Northfield Vermont, on May 24, 1868. Someone wrote a note later: Grandfather of Carrie Hayes Stebbins. Father of Josephine M. Foster Hayes. 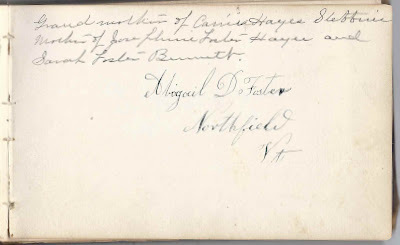 His wife Abigail (Drew) Foster signed the right facing page. 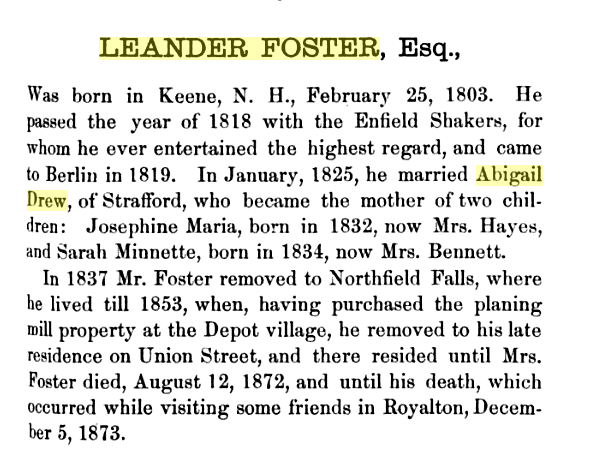 Leander Foster was born 25 February 1803 at Gilsum, New Hampshire, son of Samuel and Sally (Crain) Foster. 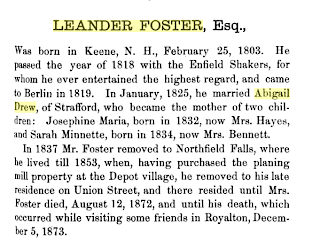 Abigail D. Foster of Northfield, Vermont. Someone later wrote: "Grandmother of Carrie Hayes Stebbins; mother of Josephine Foster Hayes and Sarah Foster Bennett". 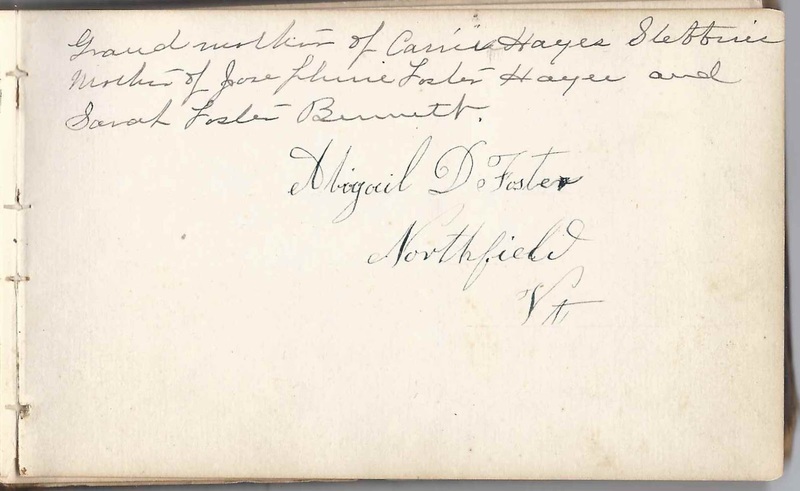 Abigail (Drew) Bennett, wife of Leander Foster, who signed the left facing page, and mother of Josephine Maria Foster and Sarah Minnette Foster. Laura Foster of Enfield, New Hampshire. Someone wrote the following note: "Great Aunt of Carrie Hayes Stebbins". Laura Foster the younger sister of Carrie's maternal grandfather Leander Foster; she was born 15 February 1805 at Gilsum, New Hampshire, daughger of Samuel and Sally (Crain) Foster. Carrie H. Hayes. 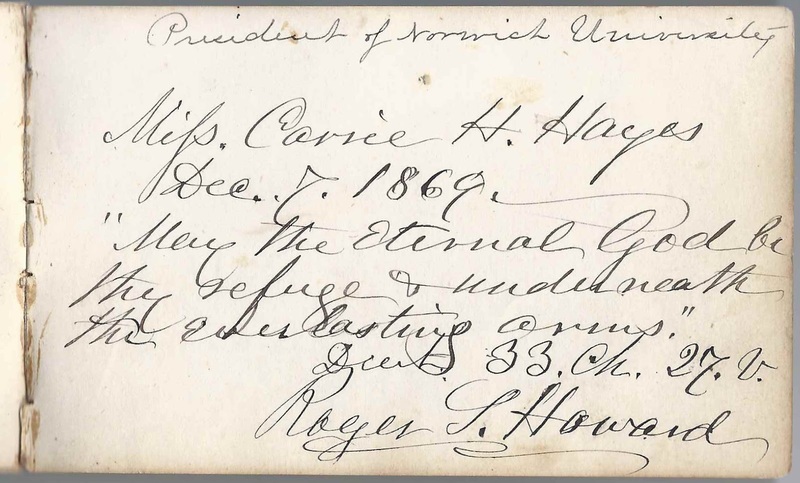 This may be a page signed by the album owner, Carrie Hortense Hayes, even though it's not the first page written on. Annabel Lee Hutchins, signed on May 31, 1874. She was born 14 April 1854 at Lisbon, New Hampshire, daughter of Carleton Brown Hutchins and Nancy Walker (Merrill) Hutchins. Married Rufus Fleming, diplomat. He died in 1920 at Edinburgh, Scotland, while Consul there. Annabel died at Detroit, Michigan, on 17 April 1934. Sister to signers Carrie E. Hutchins and Eugene Ralph Hutchins. 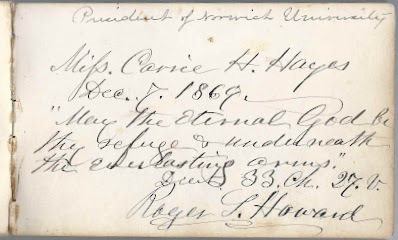 Eugene R. Hutchins, signed at Northfield, Vermont, on May 29, 1874. Eugene Ralph Hutchins, born at Lisbon, New Hampshire on 14 April 1852, son of Carleton Brown Hutchins and Nancy Walker (Merrill) Hutchins and brother of signers Annabel Lee Hutchins and Carrie E. Hutchins. Clara Maxham of Northfield, Vermont, signed on June 22, 1869. 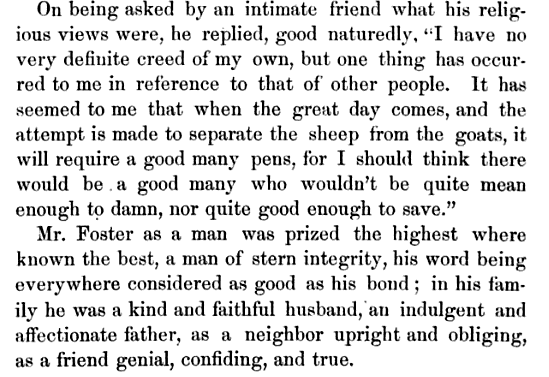 Someone, possibly even Clara herself, but with a pencil, noted: "This is champion writing"
George W. Metcalf of Northfield, Vermont, signed on January 16, 1874; Carrie's schoolmate. George W. Metcalf was born about January 1855 at Northfield, Vermont, son of Aaron D. and Martha J. (Chadwick) Metcalf. He became a merchant in Wyoming. Jennie A. Moulton of Northfield, Vermont. Presumably Jennie Adelle Moulton, born about September 1854, daughter of Joseph and Laura A. (Craig) Moulton; married at Northfield, Vermont, Harvey I. Cutting. Hannah Parkhurst of Enfield, New Hampshire. There are two possibilities, a Hannah (Huntington) Parkhurst born about 1786, died 1 November 1874 at Enfield, New Hampshire, wife of Elisha Parkhurst; and their daughter Hannah Parkhurst, born about 1813, died 15 April 1887. I'm leaning toward the latter. Jennie Gilman Phillips of Paw Paw, Michigan, signed at Northfield, Vermont, on January 20, 1872. Sarah Jane (Gilman) Phillips, "Jennie", was born 13 November 1844, daughter of Joseph and Annis (Dole) Gilman of Paw Paw, Michigan. Presumably a widow, in 1874 she married Jefferson Averill, a teacher, who was born 20 February 1847 at Northfield, Vermont. Her sister, Mary Ione (Gilman) Dole, also signed a page. Her mother, Annis (Dole) Gilman was originally from Northfield, Vermont, and Joseph Gilman was also a native Vermonter. 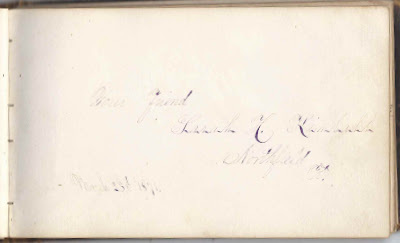 Her future husband, Jefferson Averill, whom she married in 1874, also signed a page. Rev. J. B. Pitman of Swanton, Vermont. He was Rev. 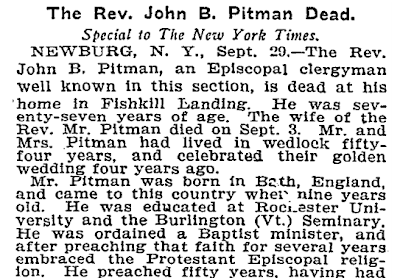 John B. Pitman, born about 1825 at Bath, England; came to the United States at age 9; graduated from Rochester University and Burlington Seminary; was first a Baptist pastor and later an Episcopal pastor at churches in Vermont, New York and Ohio. He married Mary A. Cady, daughter of Deacon Calvin and Betsey (Merrill) Cady of Northfield, Vermont. 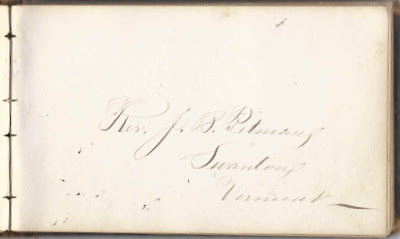 Vinnie L. Plumley, signed at Northfield, Vermont, on May 7, 1872. Presumably she was Lavinia L. (Fletcher) Plumley, daughter of Hiram C. Fletcher and Mary (Smith) Fletcher and wife of Frank Plumley. Frankie Richardson of Northfield, Vermont, signed on March 28, 1871. I found both a Frank Richardson and a Frances Richardson at Northfield, Vermont. Agnes E. Safford of Northfield Graded School, signed on November 4, 1870. In one corner, the initials L. J. 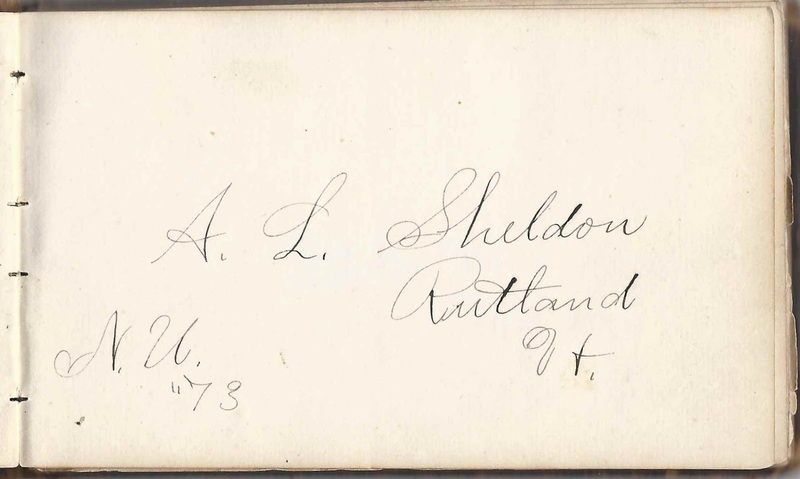 A. L. Sheldon of Rutland, Vermont, N.U. '73. 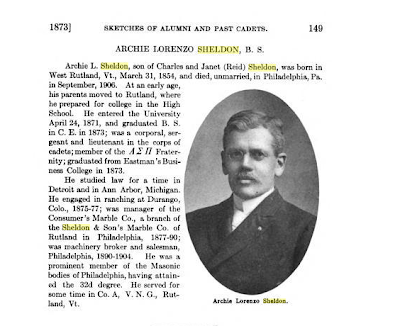 He was Archie Lorenzo Sheldon, son of Charles and Janet (Reid) Sheldon. Mina Gregory Slayton, signed at Northfield, Vermont, on June 16, 1874. She was Mrs. Mina Edna (Gregory) Slayton, wife of Henry Lake Slayton and daughter of John and Maria Gregory of Northfield, Vermont. She was an accomplished musician. Carrie Smith of Hartford, Vermont, signed on April 11, 1870. Presumably the Carrie A. Smith born about at Hartford, Vermont, in 1854, daughter of Samuel E. and Frances M. (Tilden or Alden) Smith. Kenneth Stebbins of Northfield, Vermont; "Remember me, Your Son"; Carrie's son with husband Edwin Strong Stebbins. Kenneth was born 21 November 1887 at Northfield, Vermont; he would marry Grace Inez True. Nellie M. Thayer of Northfield, Vermont, signed on April 2, 1870. She was Ellen M. Thayer, born about 1853 at Northfield, Vermont, daughter of James C. B. Thayer and Martha A. (Pratt) Thayer. She was the sister of signer Alice C. Thayer. George M. Willard of Norwich University, '70, Cadet. 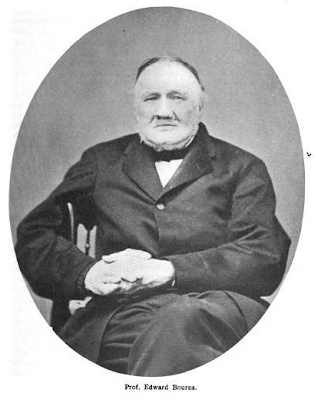 According to Norwich records, he was George Morrison Willard of Thetford, Vermont, son of James Nutting Willard and wife Mary George (Thayer) Willard. He was a civil engineer who worked on projects in North Dakota and New Zealand. He married Lottie C. Davis.